The stylized arches of the logo, representing the 32nd edition of the International Meeting in the Spirit of Assisi, recall the porticos of Bologna, the city that, as Archbishop Matteo Zuppi says, “has in itself the genes of meeting, it has been and continues to be the crossroads of peoples and cultures.” The 32nd event is being held in Bologna, October 14-16, 2018. However, problems aren’t lacking even where arms are silent. 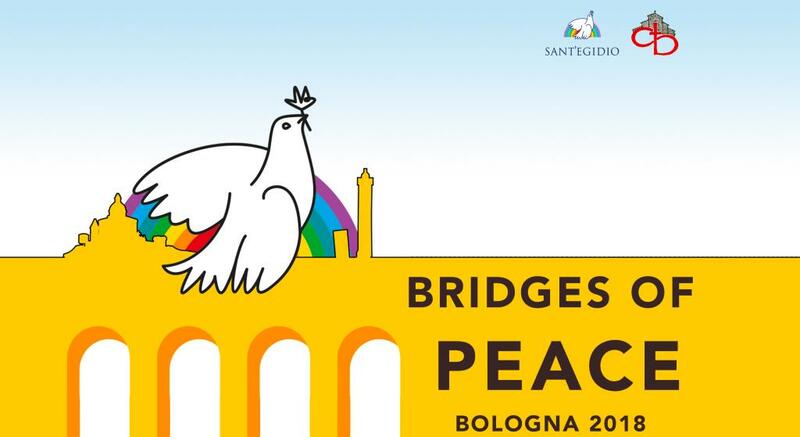 “In a difficult moment — in which sometimes many networks of living together in the peripheries of the large cities fall and walls are raised not only between Europe and Africa, to defend oneself from migrants, but also between European countries –, bridges of peace must be reconstructed together, explained the President of Sant’ Egidio Community, Marco Impagliazzo. Also speaking on October 14, 2018, in the opening assembly in the Palace of Congresses of the Bologna Fair, were the President of the European Parliament, Antonio Tajani; the Grand Imam of Al-Azhar, Ahmad Al-Tayyeb; the Chief Rabbi of France, Haim Korsia; the former President of the European Commission, Romano Prodi (“Solidarity is built here, which is a condition for peace”). The tragedy of the war in Syria was testified by Nour Essa, Syrian refugee in Italy, who arrived in Rome with her family two years ago together with other refugees in the plane that brought Pope Francis back from the Island of Lesbos and who were then received by Sant’Egidio Community along with the other 1,700 refugees fleeing from famine and war, through the humanitarian corridors that are also bridges of peace. Thirty-four panels are planned over the three days of study and work, all characterized by a choice of openness and dialogue, because “with dialogue, the shards of the world, dangerous atoms, and broken bridges are repaired” (Andrea Riccardi). This year the meeting coincides with Sant’Egido’s 50th anniversary, a Community that for 32 years has promoted international events in the “spirit of Assisi,” and with that of ’68, which will be recalled in a panel by some of its leaders. Among other issues that will also be addressed is “Europe and its Crisis,”” solidarity between the generations, inter-religious dialogue, the environment, disarmament, the role of believers in face of wars, the widespread violence in Latin America, the future of Africa and John Paul II exactly 40 years (October 16, 1978) from the beginning of his pontificate. Also taking part in the Bologna Meeting are three Bishops from the People’s Republic of China: Joseph Shen Bin, Bishop of Haimen; Antony Dang Mingyan, Bishop of Xi’an and Joseph Yang Yongqiang, Bishop of Zhoucun.